Constellation AstroChart for Digital Safety & Privacy | Constellation Research Inc. 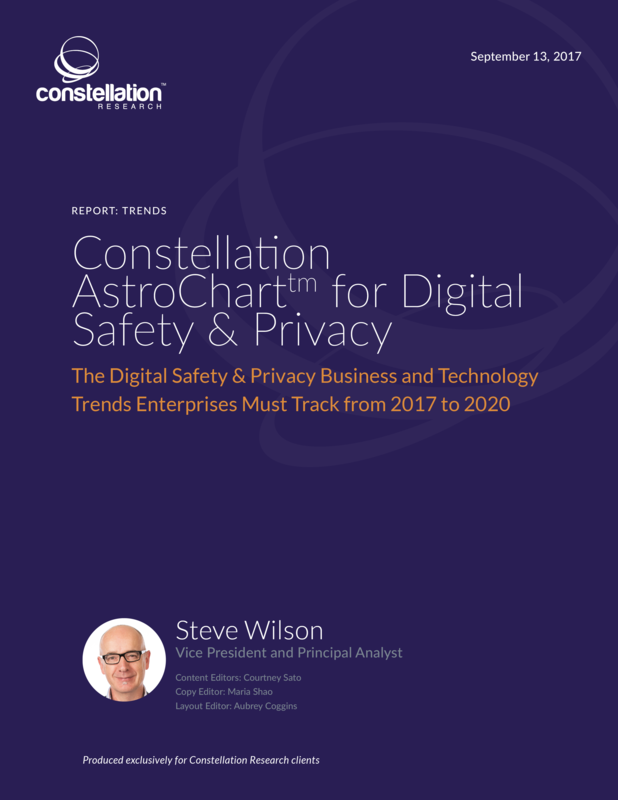 The Constellation AstroCharttm supplies a visual guide of the trends affecting Digital Safety & Privacy. After assessing boardroom priorities, organizations should employ AstroCharts to inform portfolio management. This report contains two AstroChart: one identifying technology trends and one identifying business trends. The AstroCharts’ vertical axes plot “organizational adoption” rates from mainstream to early adopter to bleeding edge. Horizontal axes plot “business impact”, the impact of the trend on an organization’s business model, from incremental to transformational to exponential. The Constellation AstroChart moves beyond both the hype and constraints of the standard 2 x 2 grid to identify the dynamics affecting the entire market. This report applies Constellation’s AstroChart to Constellation’s business theme of Digital Safety & Privacy. Digital Safety & Privacy refers to the art and science of protecting information assets, including people, while promoting innovation. Constellation’s Digital Safety & Privacy practice helps innovative organizations realize the full potential of the cloud, mobility, Big Data and the Internet of Things without compromising the safety of the business nor the privacy of users. Open research. Download free of charge.